Remembering when that wonderful journey into womanhood hit me, I received so much advice, support and information ...NOT! Maybe it was the times or just my mom was too busy to talk to me about it but I got my information from my friends which wasn't too scientific as 15 year olds didn't know a lot back then as the internet wasn't really popular (yes, I'm showing my age). When my now 21 year old hit that moment, I don't think I discussed it too much with her other than telling her about the options after having that sinking feeling of "oh no, I can now be a grandma at any point!" I think ten gray hairs grew in at that point! So I have one down and two more to go but luckily I have some time but then again, these girls are crossing over to the land of bliss earlier and earlier so who knows when my now almost seven year old will be there. 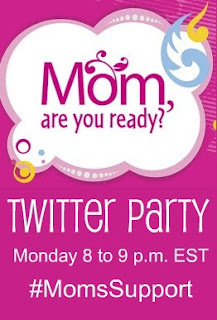 Luckily for me, I can pick up great tips and more understanding as this Monday, ResourcefulMom and Kotex are hosting a Mom Are You Ready Twitter Party from 8:00 pm to 9:00 pm EST on 2/22. Kotex has this first period kit that includes product samples, a cute bag, brochures with helpful information and more. You can get it for free by clicking here or by registering at ResourcefulMom. Join the Twitter party and you might win some of the great prizes too which includes a $250 card! That could buy a lot of pads or at least some hair color dye to get rid of the gray hairs they are about to give you!